When my husband suggested we visit Charleston, SC with our kids for spring break, there one was thing that instantly popped into my mind. Not the immaculate architecture, the historic sites, or the southern cooking. Naturally, the first thing I thought of was 'We need to visit the Charleston Tea Plantation!!'. Founded in 1888 by Dr. Charles Shepard near the site of Andre Michaux’s original tea planting at Middleton Barony [Middleton Place]. Oolong was grown here (among others) and won first prize at the 1904 World’s Fair. The plantation remained prosperous until 1915, but declined with the death of Dr. Shepard. However, cuttings from these plants were used in South Carolina’s third and fourth attempts to commercially grow tea. Both the American Tea Growing Company (eventual failure) and the Charleston Tea Plantation (located on Wadmalaw Island in Charleston County and currently operated by R.C. Bigelow Tea) propagated plants from Pinehurst. 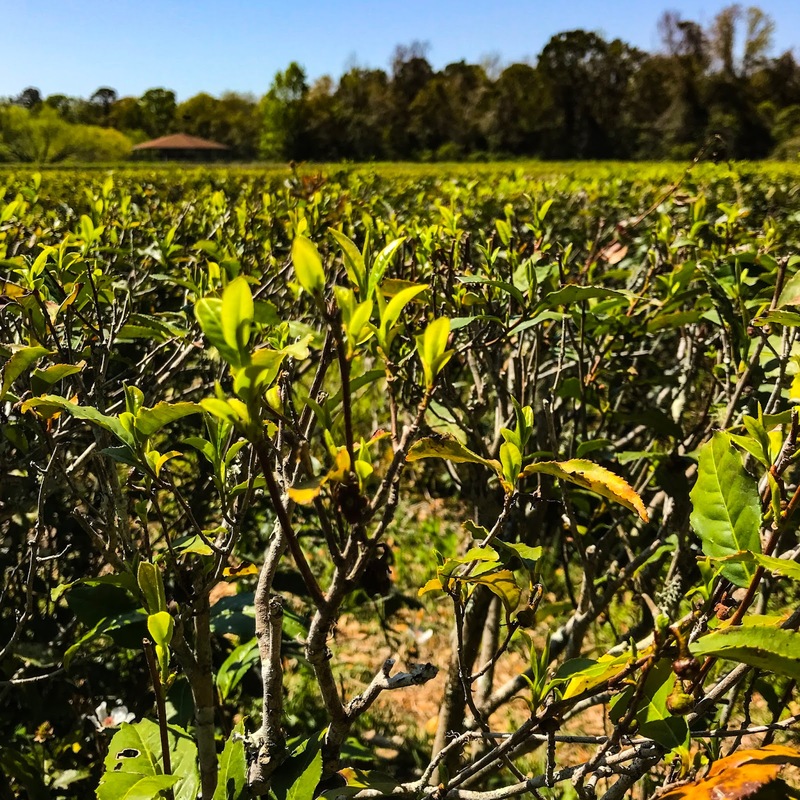 Fast forward to 1960, and the Thomas J. Lipton company purchased the Pinehurst Tea Plantation and created a center for tea research and development on Wadmalaw Island. The Charleston Tea Plantation was established in 1987 when William Barclay Hall and Mack Fleming then bought all the land from Lipton, and created the American Classic Tea brand (which is what the plantation still sells today). As you can see from the quote above, the Charleston Tea Plantation is now owned by the Bigelow company in partnership with William (Bill) Barclay Hall. Hall actually still lives on the plantation, what a lucky guy! He's a third-generation tea taster and is very passionate about his tea. He currently oversees the daily operations of the plantation and develops the product line. Ok. I'll have to stop the history here, but I think I'll need to a more comprehensive post on early Southern tea farming (including info on slave labor) as I came across quite a bit of information. A very old pecan tree filled with Spanish moss watches over the tea bushes behind it! Back to our visit. 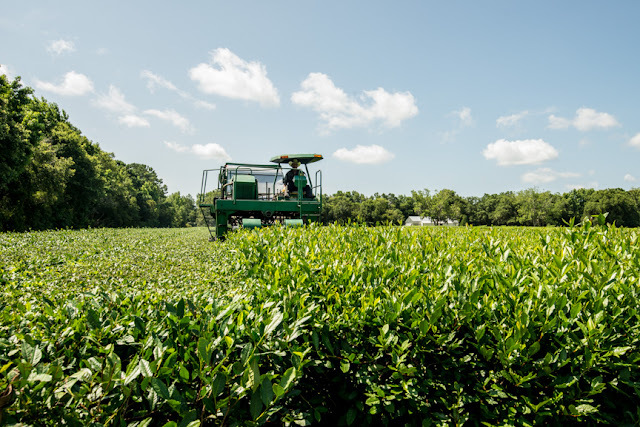 The 127-acre tea plantation is about a 40 minute drive outside of Charleston, to Wadmalaw Island. 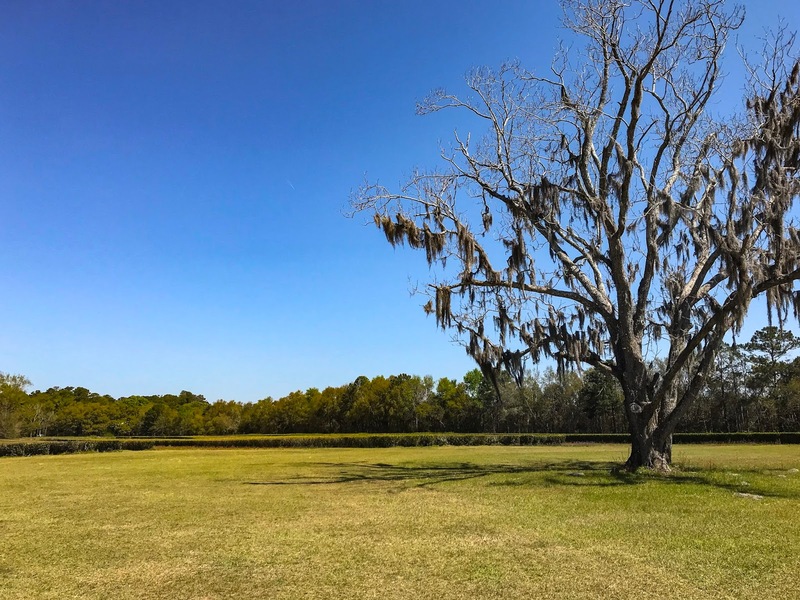 It's a lovely ride filled with live oak trees dripping with spanish moss. When we arrived we were greeted by cheerful building with a huge porch and rocking chairs, setting the tone for a relaxing tea-filled afternoon. Inside the building is a gift shop and a full bar of hot and iced teas to sample (I must note after my iced tea post last week- there were both sweetened and unsweetened versions of each iced tea to try). My kids enjoyed the sweet teas, especially the black with mint. I went for the Charleston breakfast, both hot and iced (but unsweetened). This building also leads to the tea processing factory. The tea is harvested May through October so we weren't in time to see the factory in full swing, but the self-guided factory tour was still interesting. As a tea enthusiast it was fun to get glance of their processing equipment up close. My one gripe is that they claim to be 'America's only tea garden' which is quite untrue. Perhaps it was true when they were established, but it's definitely not the case today. After the factory tour we took a comprehensive trolley tour with a friendly guide that took us all around the plantation. It was such fun to see the tea plants up close! I couldn't stop gazing at row upon row of lovely green leaves. I was also surprised at how big the tea garden is. Our guide pointed out the 'Green Giant' a harvesting machine invented by Thomas J. Lipton which is a cross between a cotton picker and a tobacco harvester. The machine is designed to cut the top layer of leaves off the tea bushes, so harvesting begins when the bushes have reached their designated height in May. The plantation does not need to employ many people to actually harvest the tea, since they have the Green Giant. After harvesting, the leaves are brought to withering beds where hot air is circulated to evenly remove moisture. Then the tea is sent through a rotovane, which are rotating blades that essentially bruises the leaves, breaking the cell walls to start the oxidation process. Leaves meant for black tea are sent to an oxidation bed, and green tea goes straight to 'fixing' where they are heated to stop oxidation. They're then sorted and finally packaged. 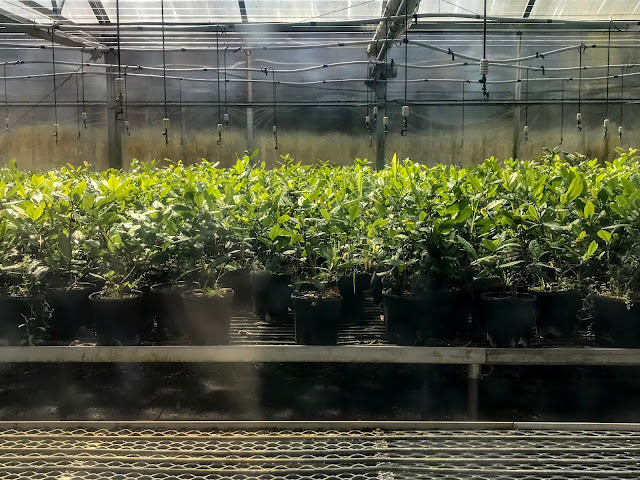 On the tour we also learned the plantation grows cuttings in their greenhouse for about 4 years until they are planted in the soil. Due to the severe weather they've had in South Carolina recently, it makes sense to always be cultivating new plants. 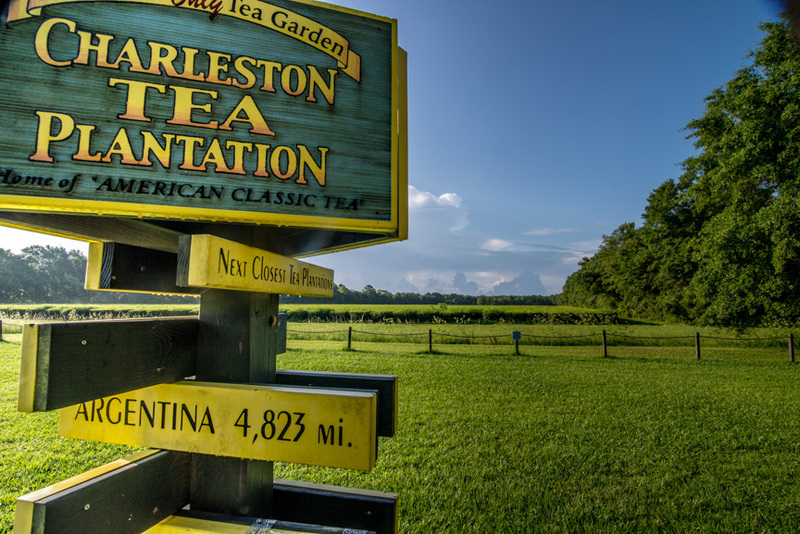 If you find yourself in Charleston, I definitely recommend a detour over to the Charleston Tea Plantation. It's a fun tea-related outing for the whole family. For videos from the plantation trip (including a look at the factory) visit my Instagram page, and check out the 'Charleston Tea' highlights posted in my bio. When I visited Charleston I chose not to visit the plantation because I wasn't sure about its connection with enslaved people. I look forward to reading your post about this history.